Last time, we did the Gordon Setter. The English Setter is a more popular favorite, an excellent family dog, and the finest of gun dogs. Setters are�members of�the Spaniel family, with Spanish ancestry, as the name implies. Like most modern dog breeds, their blood lines were established in the late 1800s, but in the case of the English Setter, there are two lines: one bred for appearance and one for the field. All setters retrieve, track, and point with a "set," a behavior which originally is thought to have been bred for bird trapping. 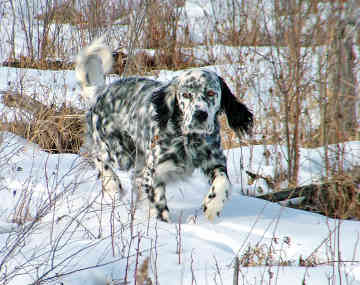 More about the English Setter here. Setters as working dogs ... ummmmmmmmm - I think that every one I have ever seen has ben barking mad, literally! well, plenty of folks use them. I never have.